Christians in Nigeria witnessed another round of bloody attacks last week as Boko Haram terrorists captured the town of Michika in Nigeria's far eastern state of Adamawa, burning buildings and exchanging fire with government troops. According to an op-ed in the Washington Examiner by journalist Douglas Burton, the attack continued for hours with an unknown number of casualties, although initial reports mentioned: "scores killed." Burton is a member of the advisory board for Save the Persecuted Christians (STPC), which advocates on behalf of more than 300 million persecuted Christians around the globe. Father Peter John Wumbadi, head of St. Anne's Catholic Church in Michika. Wumbadi told Burton he "heard bomb blasts and lots of stray bullets," which motivated him to pack six students from the parish school into his SUV and drive past burning buildings and crowds of panicked citizens who were running for cover. Wumbadi drove to the village of Kalaa, where he and the students took refuge in the parish house of Father Lawrence Ikeh, which is just a few miles away from the Sambisa National Park. It is believed some 5,000 or more Boko Haram terrorists shelter in underground bunkers in the park. 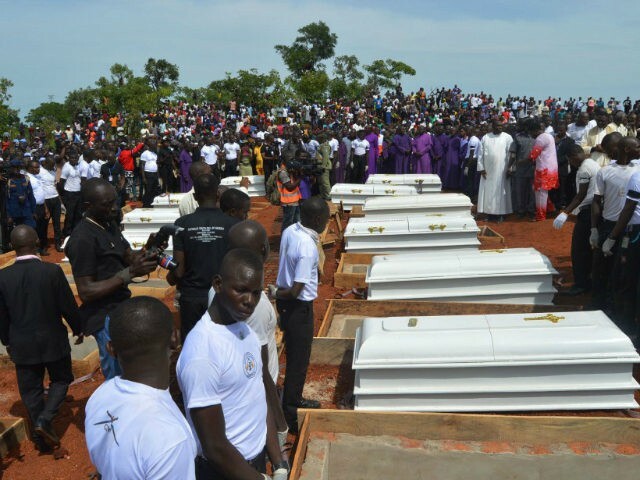 "After that attack, I came to visit the villages in the two-mile area around my church, and it was like a cemetery," said Father Ikeh, weeping. "More than 150 people had been murdered." In 2015, the Boko Haram was ranked the world's deadliest terror group by the Institute for Economics and Peace. When I see news like this, and think about where our nation and the world have been headed, it becomes clear that we have been on the brink of a long dark period in world history - maybe centuries long, and that we’ve been given a chance, a reprieve, a breath, a spark of life, by an unlikely set of events that put an unlikely person in a position to fight to stop the loss of what we hold precious. We have a deep and crucial responsibility to help him. Please cancel your cable or dish subscriptions. All subscriptions with CNN and MSNBC are directly paying for the sick things they push on the country. Get an antenna, stream over the Internet, and get movies from your library. Why can’t we treat Boko Haram like ISIS? Boko Haram doesn’t threaten the Saudis. Once again the religion of PEACE at work. No wonder that China tries to get rid of it altogether and Japan has strict limits on it. Except some dumb western nations including the US think hat (i)slam is the next best thing after sliced bread. I never thought the MSM was only biased against Israel and Jews, but also against Christians as was the Obama Regime. The MSM has also been quiet as to the disappearance of Lebabon’s Christians and the beat goes on. Bring back the Crusades. The revealing of the blood of Christian martyrs will happen at the judgment. Don’t expect justice now. It’s pseudo-intellectual liberalism, convinced that it’s wonderfully tolerant and enlightened. It wouldn’t surprise me if these same people would support cannibalism as an alternative lifestyle, and put mayonnaise on their limbs to prove their tolerance and worldliness. muslims women in New Zealand are taking off their head scarves over this. NOT!!! HAPPENING NOW: Israeli tanks heading to Gaza border as dozens or rockets are being fired from Gaza. Not just Lebanon’s Christians but Syria’s, Egypt’s, Jordan’s (Bethlehem), Iraq’s, the list goes on, plus all the ones in subSaharan Africa. What is it about what Christians read, that renders them stupidly vulnerable to the deception of mass murdering Muslims? I get justice right now, not later. That is a strong Christian. You can be a martyr dummy. Mass murderers must go through a 45, 22 and 357 first, for some of us. The movie “Machine Gun Preacher” (about 2012?) was based on true events. The preacher (ex-gang biker) found God and went to Africa on a wild hair calling. I don’t recall much of it now - but there was lots of shooting as he and some buddies helped a bunch of children. His group is now all over the world, building churches, schools, etc. I’m guessing they are still not afraid to protect the ones they love. Is that to say Comcast hates Christians? Freepers... make sure you pay your Comcast bill regularly... it matters — lol, idiots. I think you’re right. If Hillary had won it would have ushered in a new dark ages.